1. Set the power mode to VEHICLE OFF (LOCK). 2. While holding the wiper switch in the MIST position, set the power mode to ON, then to VEHICLE OFF (LOCK). 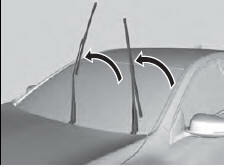 - Both wiper arms are set to the maintenance position as shown in the image. 3. Lift both wiper arms. 4. 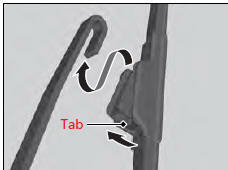 Press and hold the tab, then slide the blade out from the wiper arm. 5. 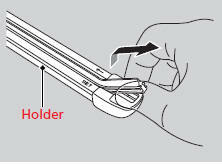 Pull the end of the wiper blade to the direction of the arrow in the image until it unfastens from the holder’s end cap. 6. 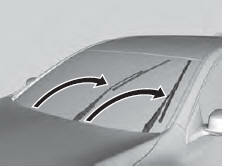 Pull the wiper blade to the opposite direction to slide it out from its holder. 7. 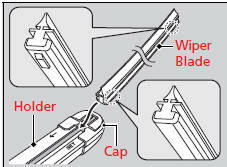 Insert the flat side of the new wiper blade onto the bottom part of the holder. Insert the blade all the way. 8. 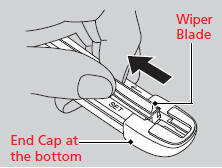 Install the end of the wiper blade into the cap. 9. Slide the wiper blade onto the wiper arm until it locks. 10. Lower both wiper arms. 11. Set the power mode to ON and hold the wiper switch in the MIST position until both wiper arms return to the standard position.